Quiet, Rural, Waterfront Retreat On Private, Secluded, Acreage to enjoy and explore! Come and experience our beautiful, secluded get away on your very own acreage. You will start unwinding as soon as you enter the front gate. This is the best of both worlds - close enough to the city but just far enough for an escape to the country. 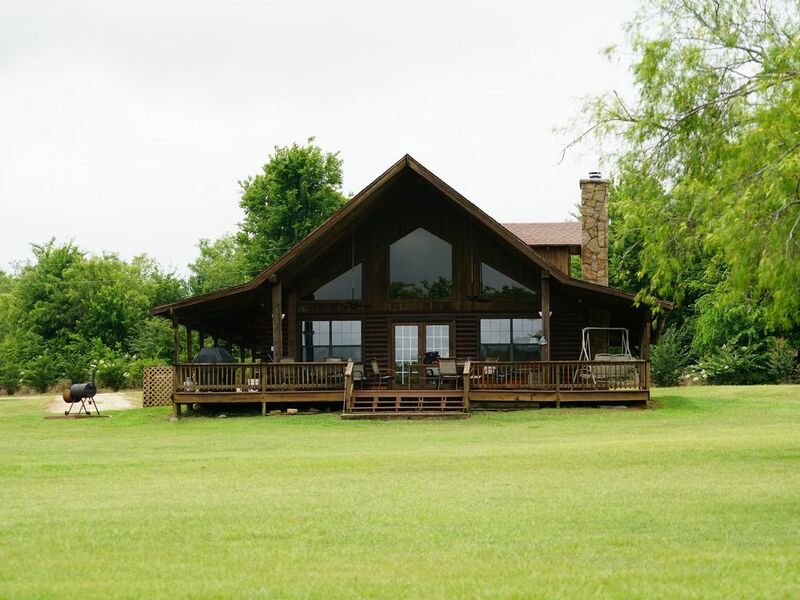 Custom Satterwhite Log Cabin - Spacious 1750 square feet of private accommodations, which is located in gated development of 10 acre tracts. We own and manage our lake cabin - you will be pleasantly surprised by all of the extras and special touches. This open floor plan, waterfront home, is located just 1 1/2 hours south of Dallas and 2 1/2 hours north of Houston. AMENITIES ON THE PRIVATE ACREAGE INCLUDE: Outside you will find the outdoor entertainment area with over 1300 sq feet of covered patio and decking. The area is accentuated with deep seat furniture and patio table for 6. A gas grill is just steps away for those fabulous lake feasts. The cabin is completely surrounded by a covered porch and deep seating to relax and enjoy the day. Don’t forget your book for the hammock! Large 1000 sq ft game house with full bath, sink, refrigerator and Vermont cast iron stove is located on the property. Play a game of pool, darts, Foosball, cards, 22' shuffleboard table, 60 Game Classic Video Arcade machine-Golden Tee Clubhouse Edition Video Arcade. Catch the latest sports on the giant screen HD TV or enjoy a game of ping pong. Located beside the game house is a lighted 40 x 60 arena for the horse riders in your group along with a round pen and pole barn. 900 feet of waterfront on the property boasts a 175 ft pier with 3 lighted slips and sundeck. THIS COMPOUND IS PERFECT FOR:: Girls Weekend Getaway - catch up with friends, laugh and relax; Guys fishing weekend - let us arrange a guide for the best fishing trip ever; Team Building, Business planning - won't find accommodations like this so close to major cities - we can help plan the weekend; Scrap Booking club, Quilting club - look no further; Trail riding - nice trails are so close, great accommodations for your horses. Family vacations - there is something for everyone. Well mannered, non-destructive, house-trained pets considered for additional fee. ACCOMMODATIONS: The kitchen is well-equipped with everything you will need to prepare a gourmet meal for you family or that mouth watering burger grilled on the provided gas grill right outside. Upstairs Master loft bedroom boasts a rustic king log bed, pillow top mattress and either high-count linens or soft jersey sheets. Downstairs bedroom #1 has king size pillow top bed and single bed. #2 has bunk bed set with two full sized mattresses as well as an extra full size bed. We provide that special touch for the young ones in your party. Available for your use is booster seats, high chair, pack & play, as well as board games and extensive DVD library. The down stairs bathroom is over-sized with hand laid Oklahoma flag stone and rain shower fixture – towels, hairdryers, shampoo, and body wash make both bathrooms complete. We provide everything to get your vacation off to a great start. We really enjoyed our stay! The view is beautiful and the game room is an amazing addition for entertaining! We were so close to all of our other family (less than 10 minutes) and hope to get to stay for all our future holidays! My family and I just spent our Spring Break here and are already planning our return trip for Summer vacation. This is the perfect place to getaway from the city and enjoy a peaceful setting on a quiet cove of a beautiful Texas Lake. We were excited by all of the previous reviews and the property did not disappoint! The cabin was perfect and had everything we needed for cooking both indoors and out. The property itself was perfect for our two dogs and allowed plenty of room to roam. The game room was awesome and allowed us to spend time together playing shuffleboard, ping pong, air hockey, and pool. We’re looking forward to visiting on a regular basis! Thank you for your kind remarks. I look forward to having you and your family stay with us again. Great property! Easy rental experience! Everything was as described, if not better. Cabin is beautiful, well kept, and clean! Both kids and adults enjoyed the game room when the weather didn't accommodate fishing. Had a wonderful time. Weather was dismal but everything else was great! This place is perfect for a weekend getaway! It has everything you need to keep you busy all weekend without having to leave the property. The view off the front porch amazing! Located on the south side of Richland Chambers Lake - Located between Corsicana and Fairfield approximately 5 miles east of I45. This property is located 1 1/2 hours south of Dallas and 2 1/2 north of Houston.